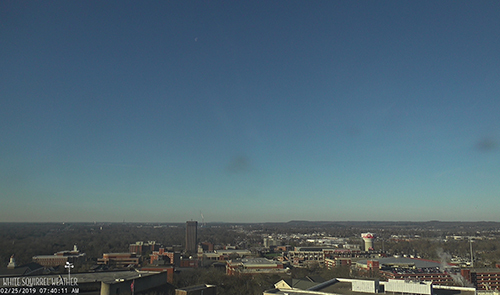 Welcome to Today@WKU, the daily newsletter from WKU Public Affairs, for February 25, 2019. WKU selects 15 for 2019-20 Cherry Presidential Scholarship: WKU has selected 15 students as recipients of the 2019-20 Cherry Presidential Scholarship, the school’s most prestigious academic award. View from the Hill: WKU alum expands Boys to Men program: Dressing for success is a lesson being taught early in the Boys to Men program which continues to expand to even more elementary schools. WKU's Amy Bingham talks to the WKU alum leading the program in this week’s View from the Hill. Parking advisory: PS1 & PS2 Used for Fourth Region Basketball Parking: WKU is hosting the 2019 KHSAA Regional Basketball Tournaments in Diddle Arena through March 5. Parking Structures 1 & 2 will be used for event parking for $5; South Diddle Lot will be reserved for KHSAA use; remaining lots around Diddle Arena will be reserved for WKU use, current permit required. Faculty, staff and students attending night class may use remaining Diddle Lots and Parking Structures. Baseball: Toppers Edge EIU Twice in Doubleheader Sweep: WKU Baseball won twice in the team's final at-bat on Sunday, sweeping a doubleheader over visiting Eastern Illinois by scores of 10-9 and 5-4. The Hilltoppers overcame a 5-0 deficit in Game 1 to win in the 10th inning and trailed 4-2 in Game 2 before scoring the final three runs over the last six frames. Next: WKU and EIU wrap up their three-game series at 3 p.m. today. Track & Field: Owusu-Antwi, Hilltopper 4x400 Relay Set School Record at Last Chance Qualifier: In what could have been WKU Track and Field's last event of the season, the squad's 4x400 relay unit notched a facility, school and Conference USA record time of 3:04.24 to earn a spot at the NCAA Indoor Championships. Individually, Martin Owusu-Antwi added a school record of his own, clocking a blazing 20.81 mark in the 200-meter dash for third place honors. Softball: Sullivan Deals 16 Strikeouts & Tops Rally for Two-Win Day: Freshman pitcher Kennedy Sullivan delivered 16 strikeouts in a complete-game, three-hit shutout as WKU Softball won its opening game of the Hilltopper Classic over Butler, 3-0. In the day's second victory, the Hilltoppers posted their third come-from-behind win of the season after scoring eight runs in the bottom of the sixth to seal a 10-3 decision over Cleveland State. WKU improved to 8-2 on the season. Next: The Hilltopper Classic concludes today. Men’s golf: Bevington Leads Hilltoppers on First Day of Tiger Invitational: WKU Hilltopper Golf's Tom Bevington carded a 1-over 73 in the first round of Auburn's Tiger Invitational on Sunday, tying him for 16th individually in a loaded field. The second round begins this morning. Tennis: Lady Tops Drop Decision at Ball State: In the third and final day of WKU's three-match, three-day road swing, the Lady Toppers were defeated 4-0 by the Ball State Cardinals on Sunday afternoon. Next: WKU (0-10, 0-2 Conference USA) is set for a weekend in Nashville, Tenn., as it takes on Tennessee State on Friday evening and Arkansas-Pine Bluff on Saturday. Men’s basketball: Hilltoppers Can't Hold Late Lead in 67-63 Loss at Old Dominion: WKU Hilltopper Basketball led by three with 1:25 to play Saturday at Old Dominion, but the Monarchs scored the final seven points of the game to deal the Hilltoppers a 67-63 road loss. Next: WKU (16-12, 9-6 Conference USA) at UAB at 6:30 p.m. Thursday. Women’s basketball: Givens Joins 1,000-Point Club in Overtime Victory at Marshall, 69-66: Dee Givens became the newest member of Lady Topper Basketball's 1,000-Point Club as WKU held off Marshall in a 69-66 overtime thriller inside the Cam Henderson Center. Next: WKU (15-13, 9-5 C-USA) at North Texas at 5 p.m. Saturday.